Team Giles - one of my long time faves of course ! Happy Blogathon! Have a great afternoon! 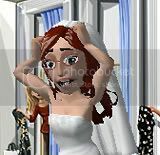 Whoo hoo welcome to the blogging love to see how your wedding goes! Thanks for coming over! And I'll pass the compliments on to the pups! :) Good luck planning the wedding! It was a stressful thing for me--but when the day comes it's awesome! Comments are nice and all, but I rather like to just sort of advertise my site on my little own and have a few close blog friends as opposed to a sorority. Stopping by to say hello and wish you a happy blog-a-thon! Congrats on your wedding! =) Happy blogathon! I am not doing a SITS post today as I am celebrating my 100th post. Please stop by and enter my giveaway. Happy Blogathon Day from one SITSta to another! Happy SITS day :) Cute blog and congratulations on getting married! Happy Bloggython Day, SITSta! How fun is this? Woo hoo!